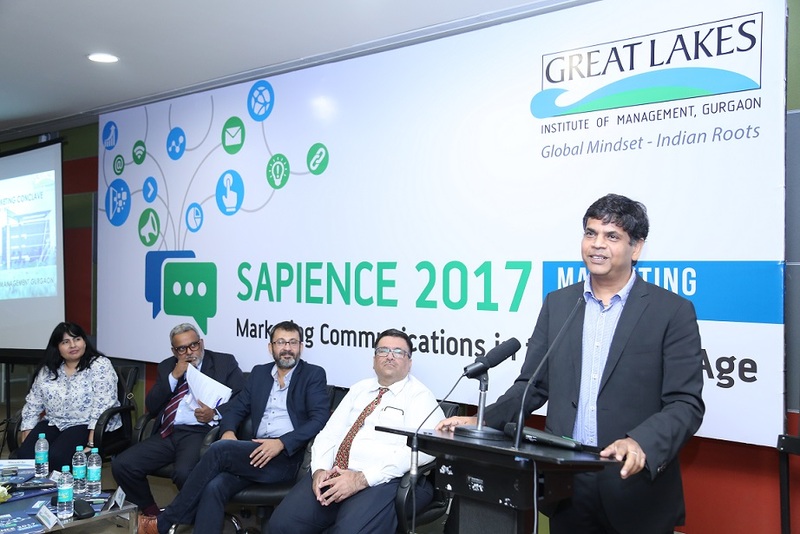 Gurgaon : Great Lakes Institute of Management, Gurgaon, a premier B-school in the country, hosted SAPIENCE 2017 – Marketing Conclave at its campus in Manesar. The Conclave was graced by the presence of Mr Anirban Chaudhuri, Senior Vice President and Executive Planning Director, J.W. Thompson as the keynote speaker. The theme of the Marketing Conclave was “Marketing Communications in the Digital Age”. The Conclave witnessed distinguished industry leaders discussing how the practices of Marketing Communications have undergone a massive change due to disruption caused by the digital revolution. Delivering the Keynote Address, Mr Anirban Chaudhuri, said, “Today we cannot think of marketing communications without digital intervention”. He mentioned that, “the unprecedented penetration of internet, wide reach of social media and data analysis together have facilitated lots of things for a marketer.” Further, he spoke about how marketers are using programmatic marketing, motion sensors, augmented reality and artificial intelligence in the promotional ads to break the monotony of notifications and pop – ups and to reach out to the right audience effectively. He gave instances where an AI Creative Director in Japan created an ad that became a huge success and how a painting was made by using artificial intelligence and data which looked like that it was painted by the artist himself, who died some three hundred years ago . However, he concluded with mentioning some of the challenges of putting technology at work. He said that, “the nature of social media is such that it is impossible to control what people are writing on any of the platforms and the same tool that helped building the image can also be used for tarnishing the image by just one wrong message posted by an angry consumer”. He concluded by adding that, “we should never be too dependent on data as data can be ambiguous and predictions can be inaccurate”. Followed by the key note address was the panel discussion on the theme “Marketing Communications in the Digital Age”, the panel comprised of Industry Pioneers such as – Ms Mausumi Kar, Managing Partner, Group M, Mr Rafi Q Khan, Executive Vice President, Weber Shandwick, Mr Vivek Nanda, Business Head, Sharp Business Machines and Mr Anil Gupta, Head, Clients Engagement, ArthImpact. 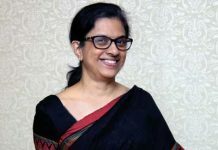 Sharing a few anecdotes from her own professional experience, Ms Mausami Kar, Managing Partner, Group M, shared that, “the customers control the brand narrative today”. She explained that, “gone are the days where a simple advertisement would reach out to the masses and a marketer’s job was done. Today, the consumer is no more a silent spectator. Today, it is the consumers who make or break the brand. if they do not like the message, they can kill the brand. Therefore, marketers no longer have a control on the narrative. They have to think the message the consumers are going to like and act accordingly. To engage the customer they have to create a spectacular brand experience and sense of loyalty about the brand. A marketer has to be prepared for the opportunities and need to act quickly. They have to keep an eye on what is gaining consumer’s interest and think of ways of associating their brand where the interest lies”. 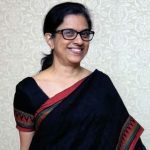 Further she said, that, “the digital media gives you an opportunity of customisation – you can create and deliver the right message to the right person by choosing the right channel of distribution. So, content plays an important role in this era of digital marketing”. Contributing to the discussion, Mr Rafi Q Khan, Executive Vice President, Weber Shandwick, said, “the first and foremost challenge in using social media is to create content which is engaging. Today, there is a clutter of content on social media, so, the challenge is to create content that is engaging and for that you have to understand your audience correctly. Second challenge is to choose the platform for communication and create the content as per the platform. The content for Facebook and LinkedIn cannot be same. The third challenge is rapidly changing technology and we need to be quick as we are on an edge, 24/7. We have to be cognizant and have to recognise opportunities”. Speaking in context of Indian Market, he added that, “what works in India for a brand is having an emotional connect, humour and the fact that the brand itself is mentioned very subtly. The Indian consumers do not like the brand name being rubbed in their faces. The campaign works if they emotionally connect with the message and they feel associated with the brand. Going further, Mr Vivek Nanda, Business Head, Sharp Business Machines, said that, “most challenging and most important factor for a marketer is to understand the customer and that is the crux of marketing. Without understanding the pulse of the customer, even with an excellent product a marketer can fall flat on his face”. He added, “There have been many instances in the past where an otherwise hit brand failed in different region because the marketers did not study that new market well before launching the product. It is imperative to understand the psyche and catch the pulse of the target audience. So, it is important to research the market well and to connect with the audience. We need to think beyond the clichés and act according to the customer’s psyche”. Mr Anil Gupta, Head, Clients Engagement, ArthImpact, stressed upon the fact that, “social media is a very powerful tool. One post on any of the social media platforms and you will get heard by the service provider or the manufacturer immediately. Social Media is sensitive and the information is traveling extremely fast today so, the marketers have to be quick, assertive and agile. About Great Lakes Institute of Management, Gurgaon- Great Lakes Institute of Management, Gurgaon, a unique Centre of Excellence in India, is focused on nurturing managerial and leadership talent for our Country. The Institute’s activities include full and part time Post Graduate Management Programs in General Management, Corporate Training Programs, Consulting Services and Independent Research to enhance the intellectual capital and knowledge base in its areas of focus. The Post Graduate Programs seek to develop motivated management professionals equipped with comprehensive domain knowledge and capable of being productive from their first day of engagement with the corporate world. The 7.2 acre Great Lakes Gurgaon campus is located just off NH8, close to Manesar and is easily accessible from the corporate hubs of Gurgaon and the Delhi IGI Airport. The Campus is fully residential with Wi-Fi enabled, air-conditioned hostels to ensure students coming from all over the country have a comfortable stay and a great peer learning experience. More details can be found at www.greatlakes.edu.in/gurgaon. Thanks for this review of this college. you described it well. thanks for the info. Get best Coaching for UPSC only in IASBaba. Register with us now. Chat Support Available. Register Online. Highlights: India’s Large Personalized K12 Learning App, Adaptive & Engaging Learning Programs, Technology Enabled Learning, Rich In Animations Video Lessons.